An award!??! I'M SO HONORED!!!!! Thank you!! And I really really love the drawings on this post. Especially the coffee and black cat ones. Adorable. I think the way you draw eyelashes is my absolute favorite ever =) and i'm a grey girl too! I love the drawings on this one! The Facebook twitter one had me laughing. The best part about this post is the wit. It is truly fun and honest! Mmmm Red wine. My favorite too. Which reminds me, I'm due for my yearly whitestrips. Congrats on another well deserved award!!! Gia: You're so welcome! Yours is one I always enjoy reading...and your drawings are great too of course! Glad you liked the cat. I've never drawn one before. Jenn: Thanks. Eyelashes are fun; it's the little things :) So happy you love grey too. It just goes with everything, like more grey. A party and a HALF: Thank you! Twitter really does make me fiendish. And don't even get me started on the #chats. I've tried twice but I can't keep up. Meghan: Thanks! I haven't seen you in a while! I wonder if Blogger isn't showing me your updates; I must go check that out! MegO: Holy cow, can you imagine? (As I sit here in my brand new grey Nike running shirt). I could turn on my webcam to check, but I'm pretty sure that is an accurate portrayal of my tweet face :) Looking forward to your post! VV: Thank you! Oh yeah, white strips. Those things are handy. My favourite drinks are an ad for those, aren't they? Yes to a Miss Congeniality reference! And I agree on Saturday. I will never understand why people say Friday because you still have to go to work on Friday. I love your drawings!! I wish I could draw. So jealous. Love those pix! LOVE THEM!!!! And it's nice to know that while athletically we have little (actually nothing!) in common, our shared love of #13 has brought us both good luck!!! 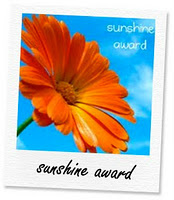 Thanx for your kind words - and for passing the Sunshine award on so stylishly!!! Aw thanks Tri-Girl, too kind! Originally my blog was going to free of swears, but sometimes there is nothing better at describing a situation than a swear word. Or maybe this just shows I'm not very literate... sh...oot. C wot I did thar. I especially loved your drawings in this one. The coffee drinking Tri-Girl sums up that drink perfectly! Cranface: You're welcome (and thanks for the kind words in your comment)! I really don't care about the language, just want to warn others since I don't have it on here. I think you are quite the wordsmith so if I've offended you, fu...dge. Hehe. Loved the eyelashes!!! Congrats on the award...well deserved!! As for the getting a blog up and going...that'd be me. Working on it and spinning in circles! Oh WOW, THANK YOU for the award!!!! I'm so honoured!!!! :D :D I'm sooo glad you enjoy reading, and thank you for being such a supportive reader! Carrie: Thanks! How did the bf like the quilt? I would love to see your blog when you've got something up! Haha, I love all your answers, esp the Miss Congeniality shout out. Too funny, you are so cute. And THANK YOU for the award. You are the best and made me smile. Want to check out a few of the other recipients now too! Thank you for the award. Your answers are so much cooler because you have pictures with them. As far as the domain thing. I got my own about a month after I started blogging. The free Wordpress didn't allow me to jazz up my page as much as I wanted. Mr. Bernie takes care of all the fees and is my webmaster, per say. i have had no problems with it. I did lock myself out of my account once by using the wrong password too many times. So he got all PMSy and griped, but other than that its been good. Texa: You're sweet :) And you're welcome! Yes, I think you should check the others out! Thank you thank you thank you a thousand times thank you! I really appreciate it. Sorry I didn't see it sooner, I was out of pocket, but I will be answering these in my own special way soon. Congrats on your award, that you were kind enough to share. Pickleope: You're welcome! I noticed your absence but did not want to stalk you. I look forward to your answers! The line about passion being perhaps too strong a word for a Canadian stuck with me. Gahhh! How did I miss this post? Thank you for my award. I will need to catch up and post on this soon! You had me dying laughing at "I'm Canadian, so passion is kind of a strong term" lol. As long as I get a *ride*.